Excerpted from Steven Raichlen’s Beer-Can Chicken. Chances are, if you’ve visited the Pacific Northwest you’ve enjoyed one of the most distinctive American ways to grill fish: on a cedar or alder plank. The process satisfies and gratifies on quite a few levels. First, the wood imparts a unique flavor all its own—a spicy, wine-like flavor in the case of cedar; a woodier, smokier flavor in the case of alder. It also tends to absorb any strong fishy flavors, a plus when serving strong-flavored fish like salmon or bluefish, to people who are iffy about seafood. The plank keeps the fish from drying out and from sticking to the grill grate (a perennial problem). Last, it also eliminates the need to turn the fish over (a task which bedevils even experienced pitmasters). Planked fish originated with the Native Americans of the Pacific Northwest who roasted the local salmon in special cedar holders over blazing embers. Inspired by the method and resulting flavor, chefs adopted the method, cooking the fish directly on a plank. 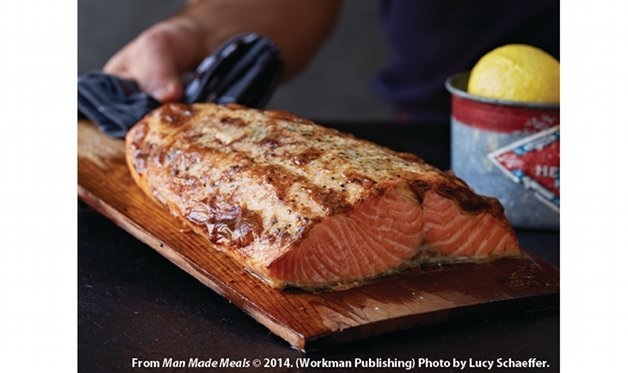 Fish can be grilled on a plank using either the direct or indirect methods. Personally, I like to singe the plank over the flames before arranging the food on it. But if you’re interested in reusing the plank, use the indirect method. The typical plank for grilling fish is about 12 to 14 inches long and roughly 6 to 8 inches wide with a thickness between 1/2 and 3/4 inch. Cedar and alder planks—and even maple—are available at gourmet stores or online. Of course, you can also go to your local lumberyard and have planks cut to size for you. Just be sure to ask for untreated wood. Get plenty of extras; once you try grilling on wood, you’ll want to cook all your fish that way. This recipe is one of the best ways I know to cook salmon. Grilling it on a plank imparts all sorts of intriguing flavors to the fish. The mustard cuts the oily taste while the brown sugar accentuates the sweetness. Plus, you’re looking at less than 3 minutes of preparation time. However, be sure to allow yourself a couple of hours for soaking the plank before you plan to grill. You can use water, beer, or salt water (about 3 tablespoons of salt for each quart of water). Be sure to find and remove any pin bones before planking using kitchen tweezers or needle-nose pliers.